Home > Research > Background: What is the Dead Zone? Dead in the Water: Background: What is the Dead Zone? The drainage basin of the Mississippi River Basin encompasses about 41 percent of the lower 48 states, and includes the majority of the nation's crop-growing area outside of California. All rivers and streams within the MRB eventually exit into the Gulf of Mexico via either the Mississippi River, or the Atchafalaya River. The two rivers are responsible for 90-95 percent of the total freshwater discharge and nutrient load brought into the Gulf (Goolsby and Battaglin 2001, Rabalais et al. 2002b). Since at least the mid-1980's (Rabalais et al. 2002a, Rabalais et al. 2002b, Scavia et al. 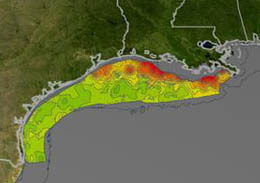 2003), it has been apparent that nitrogen carried into rivers of the MRB is fueling tremendous algal growth in the Gulf in the spring and summer months. Decomposition of this algal biomass consumes dissolved oxygen in the water column, leading to a condition of hypoxia, at which oxygen concentrations are 2 ppm or below in vast areas of the water column, for months at a time (Rabalais et al. 2002a, Rabalais et al. 2002b, Stow et al. 2005). In these conditions, very few marine organisms can survive, hence the area affected by hypoxic conditions is referred to as the "Dead Zone." The size of the Dead Zone varies from year to year, but the most recent five-year average for 2001-2005 puts it at about 6,000 square miles (N.N. Rabalais, pers. comm.) and in 2002 it was nearly 8,000 square miles (Rabalais et al. 2002a). Hypoxic conditions and pollution in the Dead Zone damage fisheries and estuarine systems important for fish and shellfish hatcheries (Diaz and Rosenberg 1995), and nutrient enrichment in the waterways of the MRB damages freshwater fisheries and threatens drinking water supplies. Hypoxia due to nutrient enrichment is a growing problem around the world (Boesch and Brinsfield 2000, Diaz 2001), but the extent of the area affected by hypoxia and the importance of the fisheries threatened put the Gulf Dead Zone in a class by itself. While technological solutions continue to improve controls over municipal and industrial waste inputs to aquatic systems, and these point discharges come under Clean Water Act regulation, there has been little improvement in agricultural and so-called nonpoint pollution control. Nitrogen inputs to rivers and streams have increased dramatically in recent decades (McIsaac et al. 2001), and these inputs — particularly nitrate-nitrogen — have repeatedly been identified as the main cause of Gulf hypoxia (Mitsch et al. 1999, Rabalais et al. 2002a, Rabalais et al. 2002b). A second condition important to development of the Dead Zone is the discharge of freshwater into the salty waters of the Gulf. Fresh water is less dense, and floats on top of the salt water, preventing oxygen recharge to lower waters (Rabalais et al. 2002a). Modifications to the Mississippi that have increased the volume of water discharging to the Gulf by straightening and channelizing the river, thereby bypassing riverine wetlands that could help remove nitrogen, have no doubt set up the conditions that favor the development of hypoxia. However, major modifications to the river were completed in the 1950's, well before hypoxia in the Gulf became the large problem that it is now (Rabalais et al. 2002b), and modeled results that separately estimate the contributions of hydrology and nitrogen inputs to nitrate flux conclude that increases in river discharge only account for about 25 percent of the increase in nitrate loading for the years 1966-1994 (Donner et al. 2002). Presently, the size of the Dead Zone is coupled with the amount of freshwater entering the Gulf. Greater discharges of freshwater not only expand the area of the Dead Zone but as flow increases, nitrate concentrations in the Mississippi River actually increase as well because nitrogen stored in soils and groundwater is mobilized and conveyed to rivers and streams. Several studies have used models of varying complexity to characterize the nitrogen sources that drive formation of the Dead Zone (Smith et al. 1997, Burkart and James 1999, Goolsby et al. 1999, Alexander et al. 2000a, Goolsby and Battaglin 2001, McIsaac et al. 2001, Donner 2003, Donner and Kucharik 2003, Donner et al. 2004). Models typically consider fertilizer runoff, decomposed crop residues, human waste, animal waste, and atmospheric nitrogen deposition to be the major sources of nitrogen in rivers and streams. Water monitoring data show that while discharge of organic nitrogen has remained essentially constant since the early 1970s (Rabalais et al. 2002a), discharge of inorganic nitrogen, particularly nitrate, has strongly increased over the same period (Goolsby et al. 1999, Goolsby and Battaglin 2001, Goolsby et al. 2001, McIsaac et al. 2001), coincident with increased use of inorganic fertilizers, although some of the increase may also be attributed to increased runoff since the mid-1950s (Goolsby et al. 2001). In addition, the seasonality of nitrate runoff has changed, with runoff showing an increasing peak around May since the 1990s (Donner et al. 2004). All studies agree that inorganic nitrogen runoff from fertilizer is the predominant source of nitrogen to rivers and streams in the MRB, with nitrate and total N discharge roughly co-varying with the extent of the Dead Zone (Lohrenz et al. 1997, Rabalais et al. 2002a, Rabalais et al. 2002b, Scavia et al. 2003, Scavia et al. 2004, Turner et al. 2006). Precipitation and runoff are important determinants of the amount of nonpoint nitrate conveyed from the land into rivers and streams, as nitrogen stored in soils and groundwater is mobilized and conveyed to surface waters (Goolsby et al. 1999). Nitrate loading tends to be highest in the spring (David et al. 1997, Lohrenz et al. 1997, Goolsby et al. 1999, Goolsby et al. 2001), due to the period of high precipitation coinciding with the period when fertilizer use is highest. Nitrate constitutes an increasing proportion of total nitrogen in runoff as agricultural land use increases (McIsaac et al. 2002, Donner 2003). Using two different approaches, Donner et al. (2002) and Justic et al. (2003) agreed that only 20 to 25 percent of the increased nitrate flux between the mid-1960s to the mid-1990s was attributable to greater runoff and river discharge, with the rest due to increased nitrogen loading onto the landscape. With nitrate concentrations in the lower Mississippi River remaining fairly constant since the early 1990s (Turner et al. 1998), formation of seasonal hypoxia now depends to a large extent on climate-driven changes in discharge. Estimating the reduction in nitrogen loading required to shrink the size of the Dead Zone is complex, because the size of the Dead Zone depends not only on runoff and nutrient inputs, but also on a variety of factors in the marine environment (Lohrenz et al. 1997, Rabalais et al. 2002a, Rabalais et al. 2002b, Stow et al. 2005). Scavia et al (2003) conclude that a 30 percent reduction in total nitrogen inputs would shrink the Dead Zone by 20-60 percent, but that in most years, this may not be sufficient to meet the stated goal of the 2001 Gulf Hypoxia Assessment's Action Plan, which is to shrink the average size of the Dead Zone to about 2,000 square miles. Because nitrogen use and inputs are constantly increasing, and precipitation and runoff have been increasing (Lins and Slack 2005), there is a tremendous amount of nitrogen now stored in soils and groundwater that remains to be released during high runoff events (Scavia et al. 2004). However, despite the uncertainty in the magnitude of needed nitrogen input reductions to the Gulf, even a small reduction, according to the Mississippi River/Gulf of Mexico Nutrient Task Force (2001), could greatly improve water quality. There is near unanimity in the scientific community that the most effective way to reduce the size of the Gulf Dead Zone is to reduce non-point nitrogen loading to aquatic systems (Mitsch et al. 1999, 2001). In 1997, the White House Office of Science and Technology Policy commissioned the US Department of Commerce, in conjunction with National Oceanic and Atmospheric Administration (NOAA), the National Ocean Service, the National Centers for Coastal Ocean Science, and the Center for Sponsored Coastal Ocean Research, to produce a series of reports that would characterize the problem of Gulf hypoxia and suggest solutions for remediation (Goolsby et al. 1999). This charge led to a series of reports and publication of an "Action Plan" (Mississippi River/Gulf of Mexico Nutrient Task Force 2001), which as of 2005 was put under the first of its scheduled five-year reviews. The Action Plan is mostly a call for voluntary efforts on the part of farmers and agribusinesses to use best management practices to prevent fertilizer runoff from farmed lands. Documentation for the first of the five-year reassessments, posted on the web in December 2005 (see below for relevant links), makes it painfully clear that little progress has been achieved toward stated goals of the Action Plan. EWG's work had two major objectives. We wanted to use current land use and water quality data to characterize sources of nitrate flux to the Gulf, and to identify which areas of the MRB are disproportionately contributing spring nitrate pollution to the Dead Zone. Going further, however, we wanted to investigate the relationship between government agricultural policy and the Dead Zone, as mediated through agricultural subsidies to farmers. 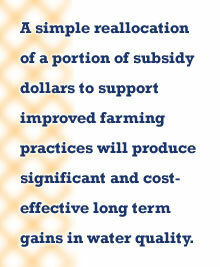 To this end, we investigated the role of agricultural subsidies in promoting farming practices that increase nitrate loading to the Gulf, and explored the effectiveness of government conservation programs in promoting cleaner water.